I've recently re-discovered isometric training. I knew about isometrics as a kid and as a young wrestler used it as a supplementary workout and got great strength results. It's one of those things that in retrospect, I wonder why I ever stopped. In this seminar, I'll explain every aspect of isometrics, and put a real modern twist on the traditions. At this seminar, you will learn how to work yourself from head-to-toe, using nothing more than a simple strap, belt, or towel. 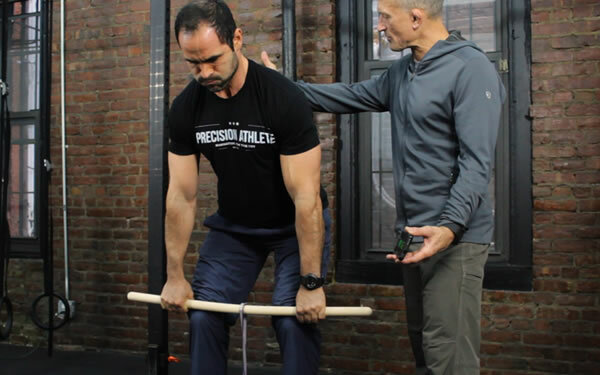 I love the portability, availability, and simplicity of the isometric protocols and I will show you many of the awesome uses and exercises I have developed for myself and my clients over the years. My favorite is the Advanced Timed-Static Contraction (TSC) protocol. Isometrics are nothing new, they've been around ever since warriors started training. Isometrics were popularized by Alexander Zass, a Russian strongman and circus performer and were re-popularized by the venerable York Barbell Club when I was a kid in the 1960s. The TSC protocol was originally developed for people in post-surgical, or post-injury, rehabilitation. One of the great things about isometrics is that even if you are injured -- even confined to a hospital bed -- you can give yourself a great workout from head-to-toe that is not only strength-productive, with a pronounced training effect, but can provide a great cardio-vascular training as well. This seminar is for people of all walks of life, all ages. It is particularly good for working around -- and rehabilitaing -- injury; thus even if you are weak, hurt, or otherwise suffering, you will definitely want to attend this seminar and discover how you can get yourself into shape with confidence and without risking further bodily harm in training. I have been using these isometric protocols for myself and my clients for several years now and getting tremendous positive feedback from around the globe.